Update 2016-10-18: This tutorial has been updated to reflect the latest version of my stack (now with Drip!). I’ve also updated pricing info (it’s technically a $0 stack now) and screenshots. The original outdated article is archived here. When it comes to setting up a marketing stack (analytics, email, automation, etc. ), you can quickly become paralyzed by choice, especially if it’s your first time. I’ve written about our industry’s need for default marketing stacks that prescribe which components to use and how best to use them, so you can get up and running quickly, avoid common mistakes, and focus on your business. Below is a step-by-step guide to setting up what I call the Boostrapper’s Stack. I’m going to walk you through the exact steps I used to configure this stack for my SaaS app Munchkin Report. Not much, to be honest! The goal is to keep the stack pretty lean. If you’re starting off with more than this, you’re probably overdoing it. If money were no object, I could swap Drip out for HubSpot, but they’re so comparable these days. 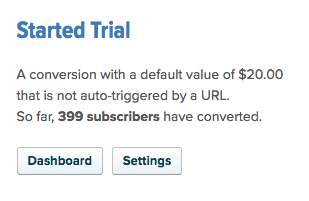 Alas, Drip is $49/month for what I need and HubSpot is definitely NOT $49/mo. This particular stack doesn’t include a nice landing page creation tool like you’ll find in HubSpot, so I simply create landing pages like I would any other page on my sales site and embed a Drip form. Pretty easy. For this project, the cost/overhead of adding a tool like Unbounce or LeadPages to the mix outweighs the benefit. If you want a drag-and-drop landing page builder, LeadPages 💙 Drip. 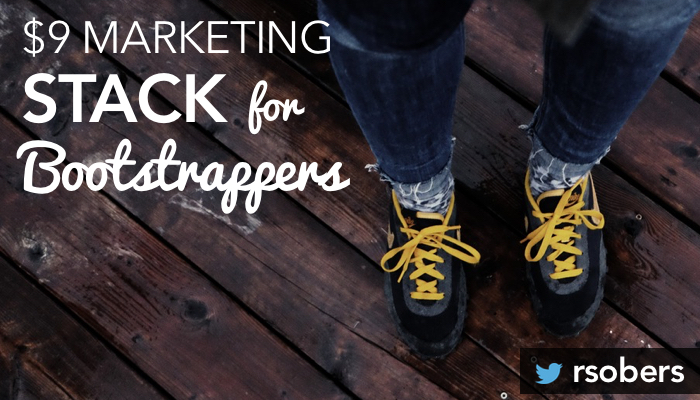 Now that I’ve described what is in the Bootstrapper’s Stack, feel free to wander off and experiment on your own. However, if you also want to know exactly how I use the stack, stick around. Before I dive into the detailed setup steps, I think it’s important understand Munchkin Report as a business. 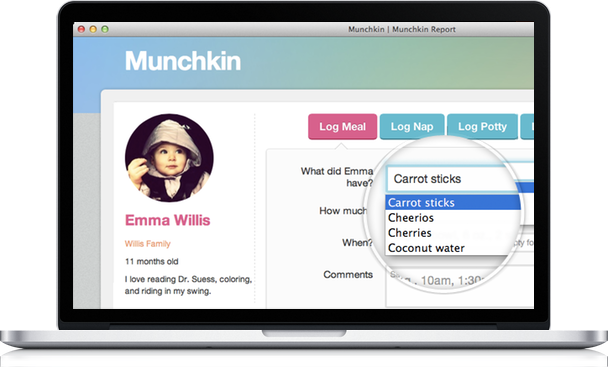 Munchkin Report is web-based SaaS with monthly and yearly subscription revenue. It is used by parents who want to track their child’s activities at home (perhaps with a nanny) and daycare centers / preschools that want to ditch paper tracking sheets, improve communication with families, and differentiate themselves. Users track naps, food, diaper changes, moods, photos, etc. The information helps parents make better decisions day-to-day, spot trends in their child’s behaviors and habits, and stay in-sync with caregivers during the day. The north star metric for Munchkin Report is the number of parents who receive an activity report per day. The app also serves as a memory book with pictures and a milestone timeline, but that’s a secondary benefit for most people. Now that you know the business, let’s take a look at the marketing machinery behind it. The first part of the stack to setup is analytics, which is a foundational element. But before you install analytics, it’s crucial to think through what you REALLY need to track. I highly recommend that you go through this exercise. Here’s the outline for Munchkin Report’s tracking plan. Segment is only the best invention EVER. Install Segment and it becomes the One True Interface to all your third-party apps. You send data to Segment and it takes care of mapping and routing that data to the apps you enable. It simplifies your setup, makes it trivial to enable new apps, and it’s more efficient. It also a cool replay feature (business plan only) which lets you send HISTORICAL data to a newly-enabled tools. Virtually all of our setup tasks for analytics and tracking will be done via Segment. Click on the Settings tab for your new source, then click API Keys. Make sure you add your API Write Key to the default analytics.js code snippet. Add the code to your website’s header template so that it loads on every page. You should start seeing pageview events in your live debugger now. Add it to your web app, too! If you also want to make client-side tracking calls from your web app (and you should), you’ll need to install the analytics.js library in your application source code as well. If you want to make server-side HTTP calls to Segment, you’ll want a server-side library. Luckily, Segment has a whole bunch of ’em. If you have a blog on a separate platform or codebase, you’ll want to add analytics.js there, too. While munchkinreport.com is a static HTML site, the blog runs on its own WordPress instance. 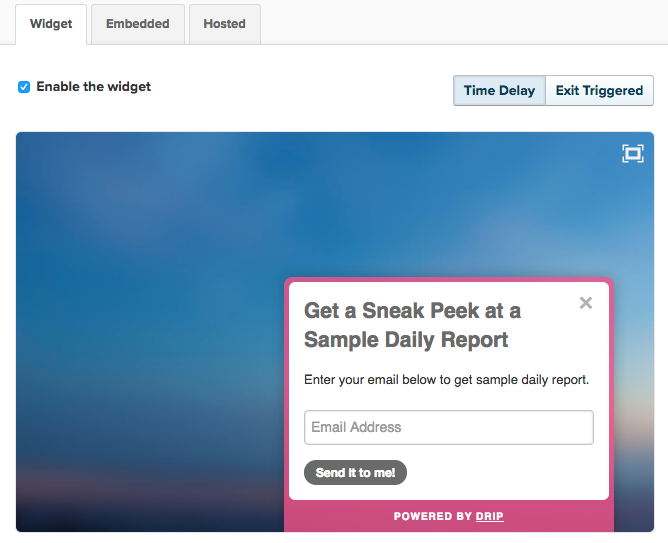 Segment has a handy WordPress plugin that automagically tracks everything you’d want to track. You can install it by searching for “segment” in the WordPress plugin search tool. Now we need to drop in bits of code to tell Segment when key things happen, according to our tracking plan. I have 3 key pages I want to track, so on each of them I’ll add a one-liner to indicate that the visitor is viewing a key page. Segment automatically cookies every new visitor to your site with an anonymous ID. When a user becomes known–via opt-in or sign up/in–calling identify links that identity to all the previously anonymous activity you’ve collected. Managing identities can be a major source of pain with analytics tools, so pay close attention to this. There are 2 points in my funnel where I’m going to identify a user: when they’re logged into the app and after they download a resource. To see how I’m identifying users after a resource download, read the section below titled Downloaded Resource. 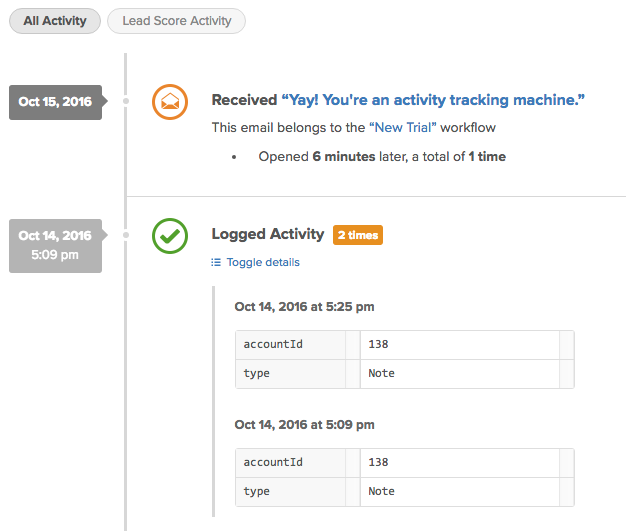 The Logged Activity event triggers whenever a user (parent or teacher) adds activitiy for a child. Since I have multiple controllers for each activity type, I have a concern that includes all of the shared methods for those controllers. 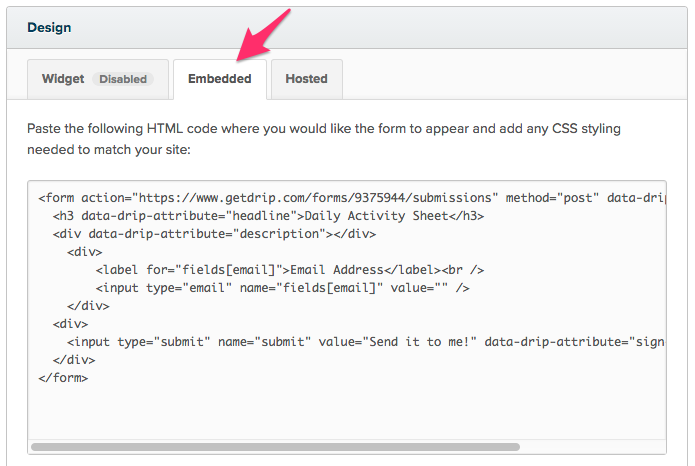 Note: if I had a landing page for each resource, I would use Segment’s trackForm helper. But because I have to dynamically set and read the hidden resourceName field on-the-fly, I had to roll my own. At this point, I’ve created accounts for the tools listed above, but I haven’t touched them yet. Instead of “installing” these tools, I’m simply going to enable them in Segment. The foundation I laid with Segment’s analytics.js and the track, page, and identify calls will start paying off. Ah, the beauty of Segment. Goals are important to setup because they add vital context to many built-in GA reports. For example, it’s nice to know which channels generate the most traffic to your site (via your Channels report), but it’s critical to know which traffic sources convert the best. You can’t do that without Goals. 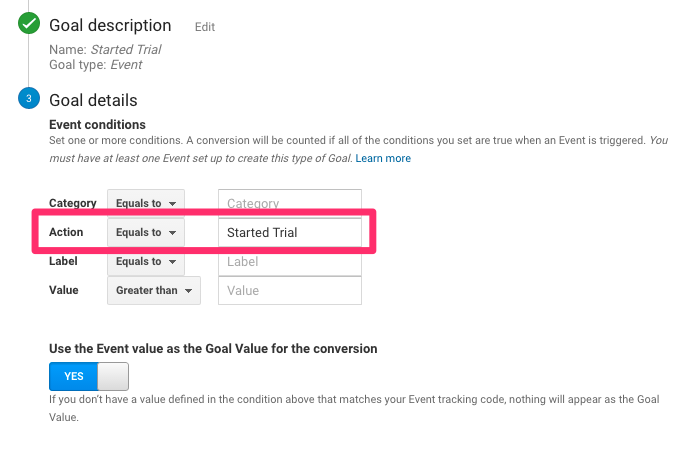 Since I already have my key conversion events coming in via Segment, it takes no time to setup Goals based on them. Because who doesn’t want to know their audience demographics and interests?! Age, gender, and categorical interest data will now be visible under the Audience tab. I like Portent’s Perfect GA Dashboard. I use Mixpanel for two core features: funnels and cohorts. The other report I like to use in Mixpanel is the Retention report, which tells me which cohorts of users are sticking around and continually using my app. You can segment by any property to get a really granular view of things. 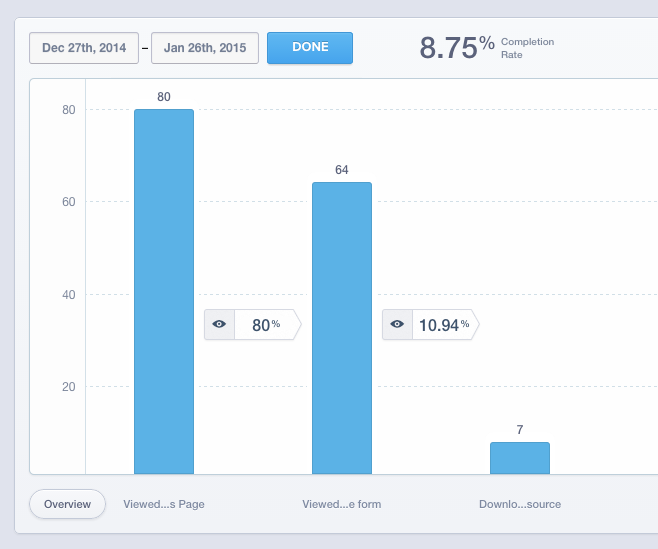 For example, you can easily get a breakdown of retention rates for each subscription plan. I haven’t really used the people reporting and notification features in Mixpanel yet, but they look pretty cool. 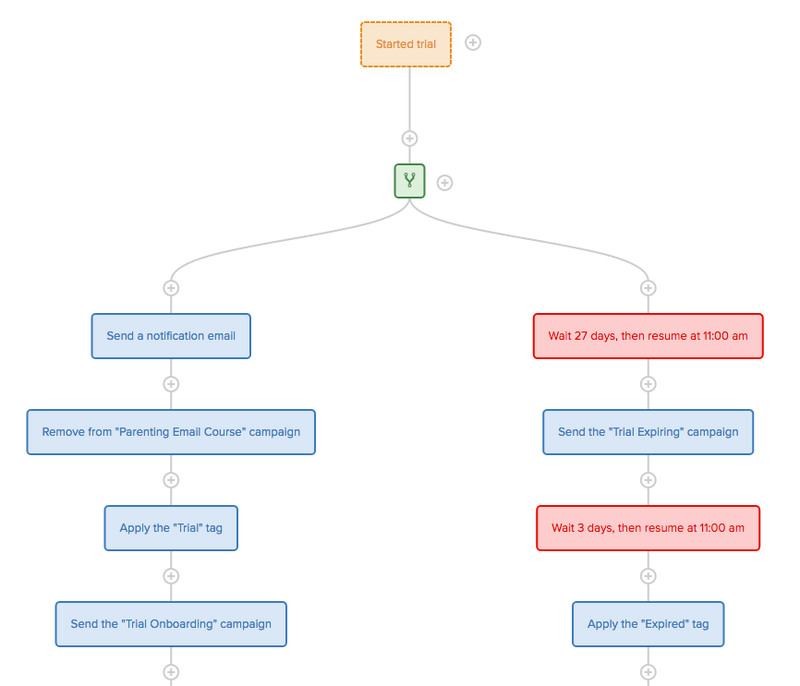 Drip is a very solid, well-designed marketing automation tool. It’s not as comprehensive as HubSpot, which has a built-in CRM, a website hosting platform, and social media tools, but they have all the core marketing automation functionality you’d expect and it’s very easy to use. The easiest way to get going with Drip is to create a form and enable the toaster widget. I have one that appears on most pages on munchkinreport.com that offers a sample daily report. // Close the Drip form when someone clicks "X"
I created a few different lead capture forms, configured the fields, and placed the embed code on the resources page on my site. 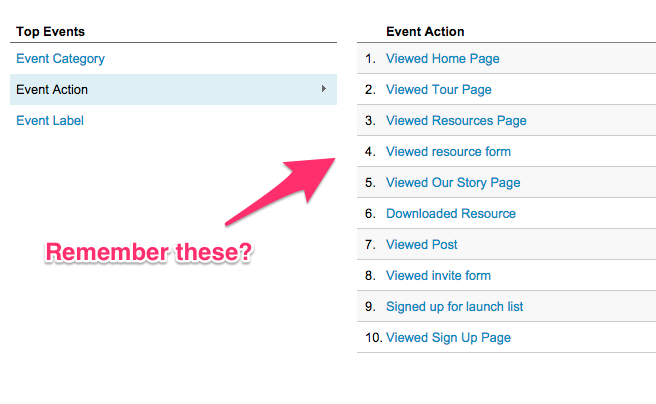 When a visitor fills out any embedded resource form, they follow the same 3 steps as the subscribers that fill out the widget. My trial signup form posts to the Rails app, not Drip, but I DO want these users in my marketing database so I can send them an onboarding email sequence, tag them, etc. So, after a new user signs up, organically or by accepting an invite from another user, I sync them to Drip via the HTTP API. I could use the Drip Ruby Client, but I already had Zapier configured so I just made a zap instead. Drip has one of the best automation workflow builders around. I’ll dive deeper into how my trial onboarding automation is setup on another post, including the copy from each of the emails I send. 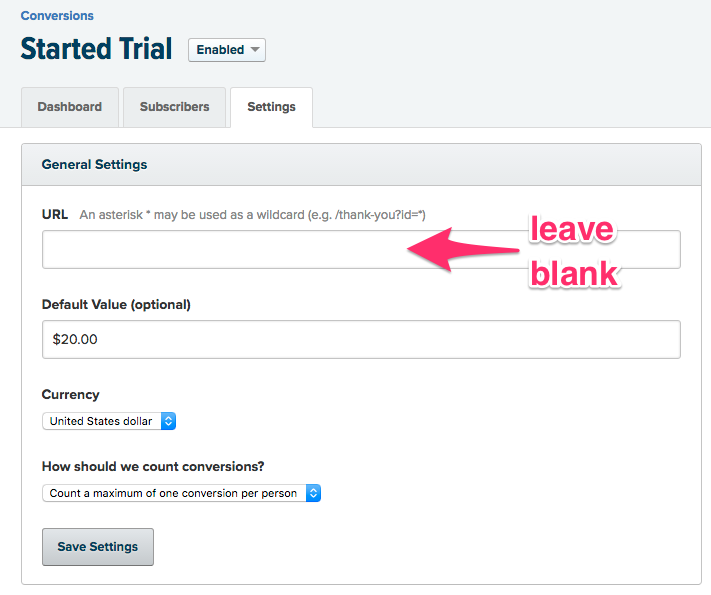 Just click on Analytics in the main nav and choose Conversions. I love the way all of the events from my tracking plan clearly display in the Drip subscriber activity feed. Need help adding your first Munchkin? Get free concierge onboarding. If you’re interested in doing NPS surveys with Drip to gather customer feedback, I’ve got a whole article that teaches you how to do that. It includes a Drip-ready NPS email template. Wow. That was A LOT, huh? This just goes to show that laying a solid foundation for analytics and marketing automation takes foresight and planning, some technical chops, an analytical mindset, and some trial and error. And my app is small potatoes compared to many of the businesses you guys are dealing with. I hope this guide can serve as a step-by-step implementation plan for those that want to use this precise stack, and for those that want to mix it up, maybe you can use my setup as a loose template. Feeling overwhelmed? No worries, I’ve setup analytics and marketing automation for dozens of companies. From e-commerce to SaaS to membership sites and more. Reach out and we can work together.